Executive Car Service is the home of the most affordable airport shuttle and transportation service in Baltimore Maryland, and the most requested car service company in the Baltimore/Washington metro areas for nearly a decade. Our state of the art dispatch technology allows us be efficient, prompt and safe every single time. If you are in town for a business meeting, pleasure or just need a ride to/from any airport, our sedan service in Baltimore is designed to make your trip memorable. Not only is it affordable and convenient than Baltimore taxi, it's loaded with safe, courteous and knowledgeable drivers who know the area very well, and hence a less hassle trip with peace of mind. 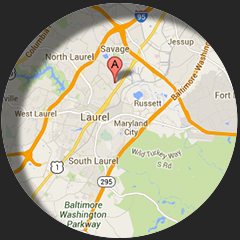 We service BWI, Dulles, Reagan and Philadelphia Airports respectively. Baltimore is the home of the Ravens and fans usually use our car service to get to/from ball games, and also utilize our hourly Limo service to get around in the city for a night out. So don't wait, make an online reservation on this site today and take advantage of tremendous savings or call our dedicated customer service reps at 410-975-8200 to customize your trip now. Enjoy the ride and see you on the road - See below Baltimore Map.